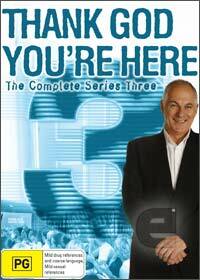 Thank God Your Hear Series 3 has become an international hit with the TV audience that has been picked up in countries such as the United States and even Russia. This current incarnation features a variety of Australian and international actors who are thrown into the deep end in this bizarre sketch show. The premise is easy, create an interesting set and storyline and throw in an unsuspecting actor to help play the role and needless to say, the results are quite entertaining. Hosted by Shane Bourne, this current season features a variety of guest stars which makes this the most entertaining to date!